Where does the stupid stop? Do we have to do what Denmark does and pay our public servants huge salaries so we can get smart people? Or maybe we can just chase some people out of town? This entry was posted in Idiot sighting and tagged idiot sighting, stupidity. Bookmark the permalink. Hmmmm … just not enough government regulations. Pay up little girl. It’s always a puzzlement to me, Steve, how we over-enforce trivial laws and under-enforce important ones. Maybe it has something to do with power – you know, beauracrats regularly exercise power over the little guy, but the big guys fight back and go buy them a congress critter. This is a perfect illustration of the deadly affects of regulation. Rather than pay the $120, she’ll likely not open up her shop. Have they no heart? I remember doing that as a small child, for me it was kool-aid, and I don’t see how anyone can let such a sweet face fall victim to a mere technicality. You know, Moe, my parents actually spent more money on my kool-aid stand than I took in. It’s not about a business, or making money. It’s about the child having fun, and learning valuable skills, such as how to manage money and serve people. Shame on them for the way they’re treating that little girl. What a pretty child she is. I totally disagree with you . I’m glad the authorities shut down this budding capitalist. Anyone can see where this was heading . Today selling lemonade, tomorrow ice tea, next week organizing tea parties. You have to stomp this stuff out early . Crush her little spirit . Now that I’ve had time to actually think about it, that little girl could really rake in the dough. 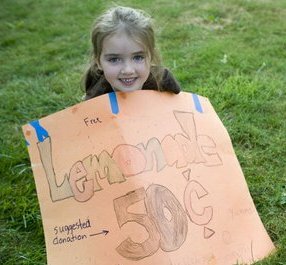 I saw a program a while back, I can’t remember the name of it for the life of me, but some little girl made a bunch of money selling lemonade with a sign that said, “put me through college” or something like that. I wonder if maybe it wouldn’t be smarter for them to hurry up and pay the 120$, and then capitalize on the publicity that this has created. With a face like that, she could make some serious money.